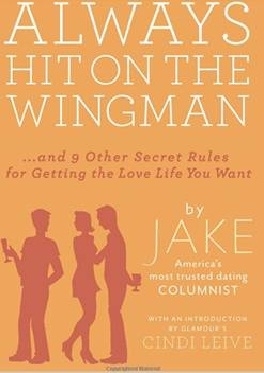 I just finished reading “Always Hit on the Wingman” over the weekend and I’m excited to share my thoughts with you on the book! Several people who know me have given me the raised eyebrow as to why I would read this book since I’m in a relationship. Even my boyfriend questioned me about reading this subject matter and flipped through the book to try and get an idea of the contents. First off, Glamour was nice enough to send me a copy to read (Thanks!). Secondly, I can honestly say that anyone can read it and take away something from it, regardless of your relationship status! Written by Jake, Glamour’s male dating columnist, this anonymous author offers 10 rules for getting the love life you want and let’s women know what men are really thinking in various situations. This is the first dating book I’ve read from a male perspective and I must say Jake is brutally honest for our own sake and he is anonymous for a reason. Being able to share his dating experiences in this book bring a sense of realness to the reader and the author. There have been several “Jakes” over the years for Glamour and we get to see some of their advice in the book too! I’ve actually tried one of the rules (To my boyfriend: don’t ask) and it’s amazing what the results have brought which is a win-win in the love game! For those who have read relationship books in the past, this is way different from the others and it’s nice to have a male perspective shed some light on the operations of guys. It’s funny how as I read this book I had a few girlfriends tell me about their dating hang-ups and I started to quote a lot of what Jake was preaching! I’m no expert, but I felt like I had some newfound knowledge to share. The key things I took from this book are that women must be themselves, broadcast your personality, and someone will take interest. Don’t settle and be open to the guys that come into your life. If one doesn’t work out so what? Move on, stay strong and it won’t be long until a new experience comes your way. As Valentine’s Day approaches, this would be a great read for women who need a refresher or lesson as to what makes love go round and how one can reach leaps abound in finding the one. The Jake who wrote the book has done just that, so he can tell you a thing or two. I don’t want to give too much away about the book, so purchase yours at Amazon and be ready to pass along the book to others – I’ve already got 3 on the waiting list and I’m sure there will be more. You’re ready to get out there and try a new method of meeting “the one.” You don’t want to force it, but being out and about will help. You could use some tips but you’re unsure of where to turn. 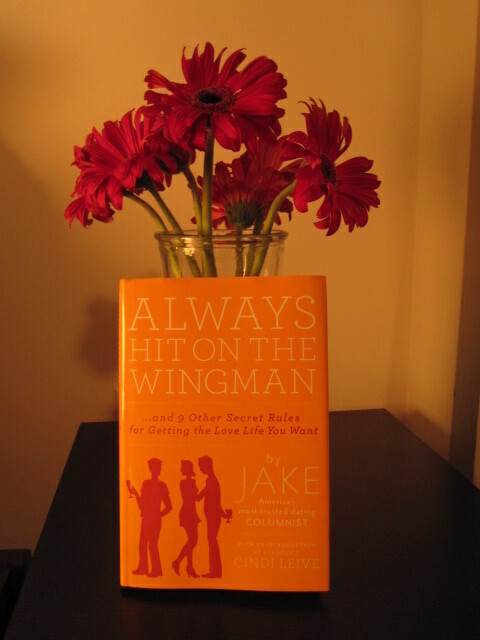 Enter the book “Always Hit on the Wingman”. Written by Jake, Glamour’s dating columnist, this book shares dating advice on getting the love life you want with 10 secret rules, one being the name of the book. I just started reading the book (thanks Glamour!) and I definitely recommend it as one not to skip over! It starts off with how he became “Jake” for Glamour and how he met the perfect girl “Orange Blossoms.” Immediately it goes into the rules for finding the love you want in a simple, straightforward way. Anyone can do it and the key thing is to be yourself. So grab your copy, find out what men really think and get the love you deserve! I already have 2 people interested in reading the book and I’m sure there will be more once I finish! Stay tuned for a complete overview.